Ocantos. This piece, however, is to also celebrate another type of fashion that is lived and breathed by attendees to the shows, some of whom have been gracing your Instagram or Facebook walls as burgeoning fashionistas and influencers. Here we analyse some styles and key elements that could be on your trending radar for the summer season. opt for a different base (such as a blue-and-yellow jumpsuit). Another dominating trend, this time via a colour, was red. Pops of red were noted either as attendees wore dresses or pants, but also in the accessories department (red bag with tassels and heels as worn by fashion blogger Dorianne Mamo). Red and tasselled? Why not? (earrings as worn by makeup artist Natasha Polidano). 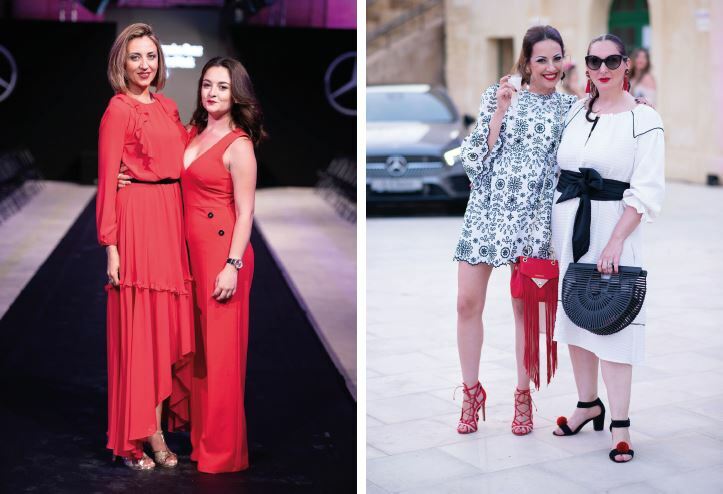 Long dresses or mid-length ones were not frowned upon or shied away from, as seen in the way Priscilla Sammut Preca (Project Coordinator for Malta Fashion Week and Awards) and Daniela Micallef (Priscilla’s assistant) almost coordinated their outfits in colour. What is even better than red and tassels together? Red and ruffles of course! 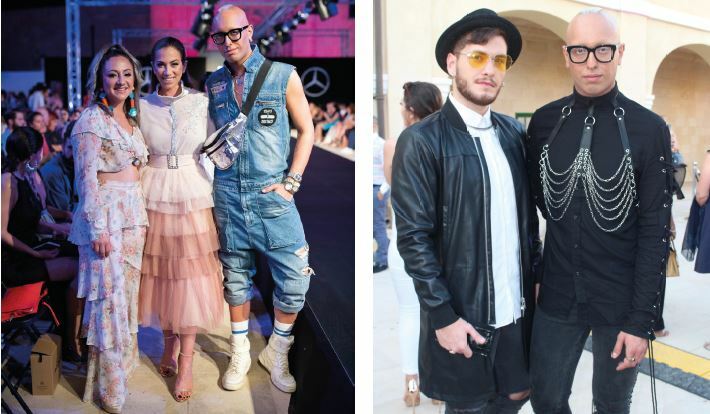 The sport-led trend was still alive and kicking during Malta Fashion Week. Track pants were matched with a sheer sleek shirt as worn by fashion blogger and award nominee Dorianne Mamo (who also matched the shirt to the turban-style band, both by local designer Rosemarie Abela). Looking at the group photo, dressing up does not necessarily mean hobbling around in sky-high heels. In fact, it was noticed that many attendees selectively stayed away from vertiginous stilettos and were more relaxed in their choice of footwear. Sensible footwear does not have to mean boring – take a look at fashion blogger Alina Anisimova’s outfit (middle; another red-pumped look) and note how perfect the Vans sneakers fit in with her cropped top, her equally cropped flared pants, and her black cap. Another winning albeit minimalistic look can be seen via influencer Marie Claire Portelli (right) who wore her box-fresh white Nike pair with checked high-waisted pants and a spartan white tee. With hair sleeked back, this was one punchy look. Speaking of hair, there were quite a few attendees and influencers who took the turbaned route, such as fashion writer Inna Kay of Creative Direction One (left) who donned a striking skin-coloured shawl-like head cover that chimed in perfectly with her blue-toned ruffled and flared outfit. Don’t you love blue and tan for summer? (Sidenote: if wearing sneakers sounds stifling for summer, try comfortable espadrille-like wedges). Another structured but youthful look was noted in the interesting mix of a crisp white crop top and striped pants which, together with strappy white heels, all spell being ready for summer. If you do not experiment and get out of your comfort zone during Fashion Week, where or when else can you do so? Indeed, Fashion Week is not only a riot of colours, designs, and styles, but a golden opportunity to shine, dazzle, and escape normalcy. Being daring and adventurous during Fashion Week is a calculated risk, but without the fear and angst of being labelled as weird-looking or being frowned upon. Indeed, the message transmitted through Fashion Week should be more than that. It should extend to fashion on a daily basis. When local influencers (read: style tornadoes) like Tamara Webb and Danita Camilleri bring forward a healthy dose of fun, light-heartedness, and positivity to the table of fashion, what is there not to love? Why choose clothing that oppresses or limits us when it is meant to colour our world and give us a few breaks from the doldrums of life? This extends to men too. 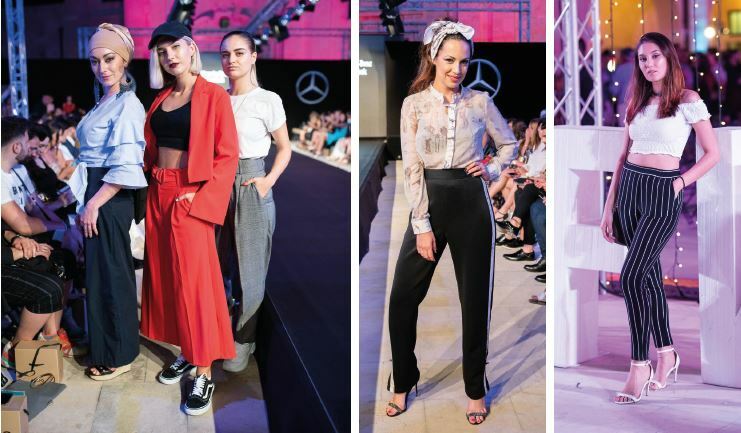 designers such as Ritienne Zammit have also reworked norms and stereotypes, and it comes as no surprise that Ritienne’s work was chosen to represent the campaign poster for Malta Fashion Week and Awards. To conclude this fashion analysis, it can be said that dressier gowns have returned with a vengeance. Relegated to the ballrooms or halls of weddings, the longer-hemmed dress has claimed the attention and once again sashayed its way into our lives (e.g. pretty in pastels like model and award winner Madeleine Baldacchino). Enter couturiers such as Luke Azzopardi and Gaetano who are catering not only for the extravagant wedding market, but are also creating custom-made beauties for occasions such as fashion week and the much-awaited fashion awards night. They say a girl can dream if only for a night, but when wearing one of these creations, it is women who can indeed feel like princesses. Whilst Tamara Webb’s dreamy floaty gown with tulle for days was designed by Gozitan Luke Azzopardi, model and award winner (for fashion influencer) Sarah Zerafa’s peek-a-boo animal printed floor-length gown was specially made for her by Gaetano. This goes to show that local talent can be cherished and supported. As the wedding season has earnestly started, you know who your port of call should be for custom-made one-of-a-kind showstopper gowns. 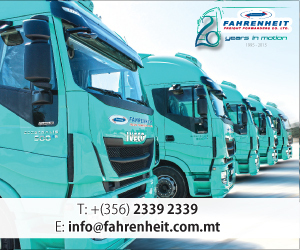 Go bold or go home, as you have often heard them say. Credits: photography by Justin Ciappara whose work during Malta Fashion Week and Awards included documenting people’s outfits.